ISIS’s seizure of large swaths of Syria and Iraq and its killings of civilians and soldiers have dominated discussions during five days of speeches at the United Nations General Assembly podium and on the sidelines. But Netanyahu described Iran, ISIS and the militant group Hamas that controls the Gaza Strip as part of a single team, comparing them all to Germany’s Nazis, who killed six million Jews in World War Two. “It’s one thing to confront militant Islamists on pickup trucks armed with Kalashnikov rifles, it’s another thing to confront militant Islamists armed with weapons of mass destruction,” Netanyahu said. Iran rejects allegations by Western powers and their allies that it is developing the capability to produce atomic weapons and wants economic sanctions lifted as part of any nuclear deal with six countries negotiating with Tehran. By describing Iran, ISIS and Hamas as part of the same team, Netanyahu appeared to play on doubts among U.S. lawmakers about the wisdom of President Barack Obama’s decision to engage with Tehran after the 2013 election of President Hassan Rowhani, a soft-spoken pragmatist, to resolve the 12-year-old nuclear standoff between the Iran and the West. “You know, to say that Iran doesn’t practice terrorism, is like saying Derek Jeter never played shortstop for the New York Yankees,” he said. These issues will undoubtedly come up during Obama’s meeting with Netanyahu in Washington on Wednesday. He twice referred to the “ISIS of Iran,” which would appear to be a deliberate play on the country’s official name - the Islamic Republic of Iran - and ISIS, which is often referred to as ISIS. 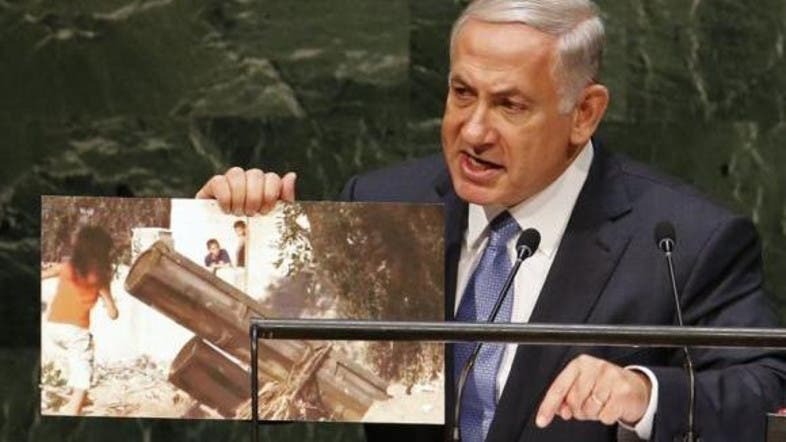 Netanyahu referred mockingly to Rowhani’s speech to the assembly last week, in which he accused the West and its allies of nurturing the group. “Iran’s President Rowhani stood here last week and shed crocodile tears over what he called the globalization of terrorism. Maybe he should spare us these phoney tears and have a word instead with Iran’s Revolutionary Guards,” he said. Rowhani said he supported efforts to combat ISIS, a Sunni militant group that views the predominantly Shi’ite Iran as heretical, though he said it should be handled by the region, not countries outside the Middle East. Iran and six world powers held 10 days of talks on the sidelines of the annual gathering of world leaders at U.N. headquarters in New York City but made little progress in overcoming deep disagreements on issues such as the future scope of Tehran’s nuclear program and the speed of lifting sanctions. The talks involve Iran, the United States, Britain, France, Germany, Russia and China. They are aimed at getting a long-term agreement that would gradually lift sanctions against Tehran in exchange for curbs on its atomic program. Netanyahu’s strident critique of Iran may be a preview of the hard line he will take in Washington. He has repeatedly warned Obama not to make concessions in the nuclear talks. On the topic of the peace process between Israel and the Palestinians, he expressed his support for a “historic compromise” with the Palestinians that would bring peace and stability for the Israeli people and the region. But he offered no new details of what such a compromise would envisage. An Egyptian-brokered ceasefire in late August ended a 50-day war in the Gaza Strip between Israel and the Palestinian militant group Hamas that controls Gaza. Israel began an offensive on July 8 with the aim of halting cross-border rocket salvoes by Hamas and other militants. The conflict devastated some Gaza districts and killed more than 2,100 Palestinians, mostly civilians, according to the Gaza health ministry. Sixty-seven Israeli soldiers and six civilians in Israel were also killed.